Python numbers are a group of four data types: plain integer, long integer, floating-point and complex numbers. They not only support simple arithmetic calculations but can also be used in quantum computation as complex numbers. In this tutorial, we’ll try to explain each of them with examples. Let’s see what numbers in Python are? Like other types in Python, numbers are also objects. They can store an integer, a real or a composite number. Python numbers are immutable objects so any change in the value would lead to the creation of a new object. Usually, assigning a numeric value to a variable will get the number object created. >>> num = 10 + 5j # The number object got created. >>> type(num) # The number is of complex type. >>> id(num) # The initial address of 'num' in memory. >>> num = 11 + 6j # The 'num' gets a new value. >>> type(num) # The 'num' is still of complex type. >>> id(num) # Change in value caused 'num' to have a new memory address. Interestingly, Python 2.x had four built-in data types (int, long, float and complex) to represent numbers. Later Python 3.x removed the long and extended the int type to have unlimited length. The int type represents the fundamental integer data type in Python. The plain integer in Python 2.x had the maximum size up to the value of sys.maxint. While in 3.x, the int type got promoted to have unlimited length and thus eliminated the long. An integer number with unlimited length. Until the end of Python 2.x, the integers were allowed to overflow and turned into a long. This behavior changed since 3.0, where the ints replaced the longs. >>> type(x) # In Python 2.x, the type will be long. While in 3.x, it is int irrespective of the size. The float represents a binary floating point number. Using a float variable in an expression automatically converts the adjoining longs and ints to floats. The number of this type has a real and an imaginary part. For example – The expression (n1 + n2j) represents a complex type where both n1 and n2 are the floating-point numbers denoting the real and imaginary parts respectively. The number types are automatically upcast in the following order. While integers in Python 3.x can be of any length, a float type number is only precise to fifteen decimal places. Usually, we work with numbers based on the decimal (base 10) number system. But sometimes, we may need to use other number systems such as binary (base 2), hexadecimal (base 16) and octal (base 8). In Python, we can deal such numbers using the proper prefixes. See below. If you want to test the class type of a number in Python, then you should use the isinstance() function. If you use mixed data types in an expression, then all operands will turn to behave as the most complex type used. Be careful while dividing integers in Python. In Python 2.x, the division (/) will return an integer quotient as the output. In Python 3.x, the division (/) will return a float quotient as the output. The floor operator (//) returns the integer quotient, and the mod (%) operator gives the remainder. However, you can get both these by using the divmod() function. 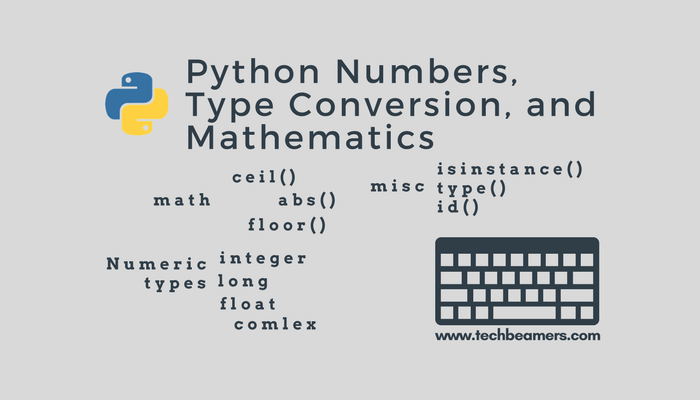 In Python, it is pretty easy to convert any numeric data type into another. We call this process as coercion in Pythonic term. Basic operations such as addition, subtraction coerce integer to float implicitly (by default) if one of the operands is a float. In the above example, the first integer (2) turned into a float (2.0) for addition, and the output is also a floating point number. However, Python lays out a no. of built-in functions such as int(), float() and complex() to convert between types explicitly. These functions can even convert strings to numbers. Please note that if you are doing a conversion of a float to integer, then the number will get truncated (i.e., the integer which is close to zero). As you’ve read above that Python’s built-in float class has a limit to control precision up to the fifteen decimal places. However, there are other limitations as well because it entirely depends on the computer implementation of the floating point numbers. For example, see the below decimal point issue. To overcome such type of issues, we can use the decimal module in Python. The decimal module provides the fixed and floating point arithmetic implementation which is familiar to most people. Unlike the floating point numbers which have precision up to 15 decimal places, the decimal module accepts a user-defined value. It can even preserve significant digits in a no. Python packages a module named as ‘fractions,’ to handle fractional numbers. A fraction combines a numerator and a denominator; both are of integer data type. This module enables rational number arithmetic functionality. Here is a simple example to create and use fraction type objects. Python exposes a few built-in functions to carry out simple mathematical calculations. For example – abs(), cmp(), max(), min(), round(). Apart from the above methods, we can also use the math module in Python. It provides following common functions to use. The absolute value of x: the (positive) distance between x and zero. The base-10 logarithm of x for x> 0. The fractional and integer parts of x in a two-item tuple. Both parts share the same sign as x. The integer part coerces into a float. x rounded to n digits from the decimal point. Here are some examples of using the ceil() function. With the help of Python numbers and the math module, you can do any basic to advanced computations in Python. We hope this tutorial would be able to uplift your learning spirits. Anyways, if you find something new to learn today, then do share it with others. And, follow us on our social media (Facebook/Twitter) accounts to see more of this.